Tonight the Vancouver Giants return to the storied Rink on Renfrew for their first of two games this season. The month of December begins for the Giants who bring a four-game winning streak to the Pacific Coliseum for their first of back-to-back games this weekend against the Tri-City Americans. 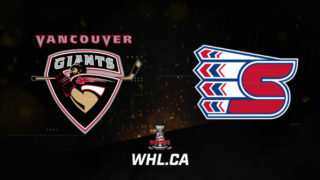 The Giants are taking the ice for the third time in a span of five days while the Ams were in action last night at home against the Kelowna Rockets. Tonight’s game marks the first time this season that these two clubs will face one another. 1999-born forward Issac Johnson comes into tonight’s game riding a five-game point streak for the Tri-City Americans. The 1999-born forward from Andover, MN has notched two goals and three assists for five points in that span and has played a big part in the team’s early season success. Coming into this weekend Johnson sits second on the team in goals (9) and second on the team in points (28). He’s added four power play goals, two game-winners and has a plus-minus rating of +2. Last season as a rookie, Johnson scored 17 goals along with 31 assists for 48 points. He added five goals and eight assists for 13 points in 14 playoff games. 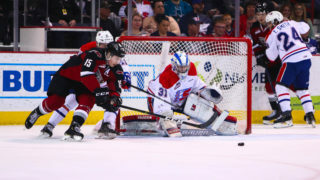 In four games last season against the Vancouver Giants, Johnson potted two goals. 1999-born goaltender Beck Warm has been a workhorse for the Tri-City Americans. The Whistler, B.C. native has started 23 of Tri-City’s 24 games this season and has compiled a solid record of 13-9-1-0 with one shutout, a 2.97 goals-against-average and a .906 save percentage. In 69 career regular season games with Tri-City, Warm has gone 32-26-2-1 with two shutouts, a 3.40 goals-against-average and an .895 save percentage. He’s 1-1 lifetime against the Giants and was 0-1 against the Giants a season ago. Earlier this week the Tri-City Americans made a big move acquiring 20-year-old defenceman Aaron Hyman from the Regina Pats in exchange for Brett Clayton and some draft picks. 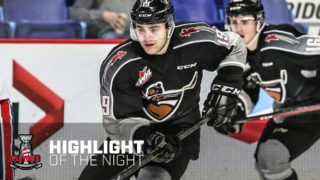 Hyman has notched five goals and 21 assists for 26 points through 27 games and currently sits tied for third in scoring among WHL defencemen. At 6’5” and 221 pounds, he’s hard to miss. Hyman helped the Seattle Thunderbirds win a league championship in 2016-17 and has 30 career WHL playoff games under his belt as well. Davis Koch has a seven-game point streak. In that span he’s got five goals and nine assists for 14 points. Dylan Plouffe has a seven-game point streak. In that span he’s got three goals and six assists for nine points. Milos Roman has goals in four straight games. He’s added two assists for six points in that span. Bowen Byram has points in four straight. He’s got a goal and four assists in that span. The Giants penalty kill has gone three straight games without allowing a power play goal against, going 16/16. The Giants power play has scored in four straight games going 6/19. The 2001-born goaltender from Winnipeg has won each of his past three starts and six of his past seven starts dating back to October 28th against the Brandon. Coming into the weekend Miner’s goals-against-average is tops in the WHL at 1.55 and his save percentage of .944 is tied for first in the league along with Prince Albert’s Ian Scott. Trent Miner has never faced the Tri-City Americans in regular season play. 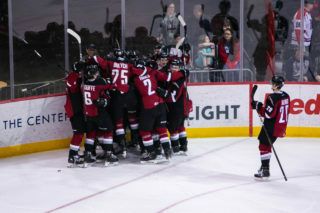 A number of veteran Vancouver Giants players are familiar with the Pacific Coliseum having suited up for the Giants (and opposing teams) during the 2015-16 season. 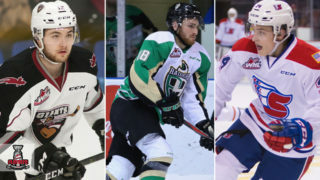 Owen Hardy, Matt Barberis, Dylan Plouffe, Dawson Holt, David Tendeck and Kaleb Bulych have all played home games before at the Coliseum while Davis Koch and Jared Dmytriw would have played at the Rink on Renfrew in visiting uniforms. A big key for the Giants tonight will be not letting the emotions and the energy of a new building distract them from the task at hand.